On Sunday, January 27, 2019, the United States Postal Service® rate change will take effect. 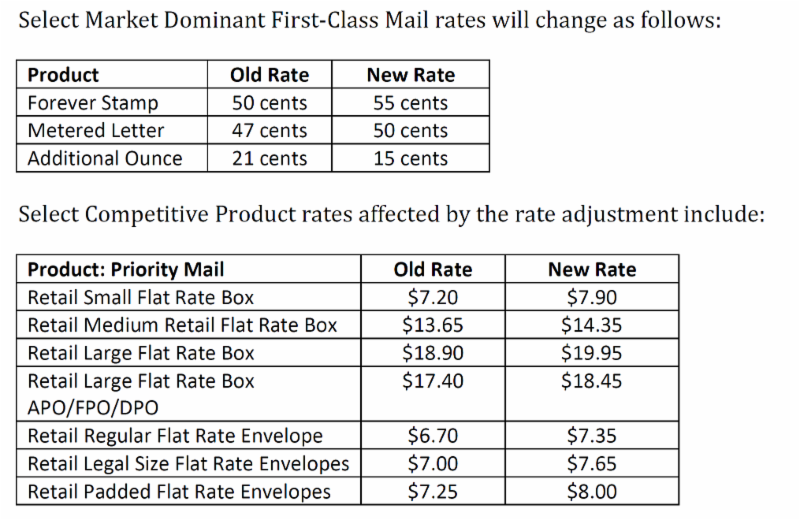 While the USPS will increase the single-piece first ounce rate to $0.55, the metered mail rate will increase from $0.47 to $0.50. For a complete list of January 27, 2019 changes, visit http://pe.usps.gov/ and look under the header “January 2019 Price Change”. If your machine has the downloadable rates, here are general directions on how to download the rates into your machine and verify the download completed or you may also visit http://kb.neopostinc.com/ and select your machine for step by step directions specific to your machine. Here we have also provided a Rate Availability Chart and a Supported Products Chart . The Rate Availability chart shows which machines are able to download the update and which must have a card/chip shipped for the update. NOTE: January 2020 will be the final USPS rate event supported for the SE/ST/WJS scales. Due to the timing of this rate change we will not be sending out letters and order forms as we have done in the past. If your machine requires the card/chip to add the new rates please call Neopost at 1-800-NEOPOST. If you have any questions, please call your respective office location. Numbers and locations are listed below. If you no longer have a Neopost or Hasler mail machine, please contact your respective office to be removed from our mailing list.